It is with a very heavy heart I write to tell you I had to let my Bingo go to the bridge last night. 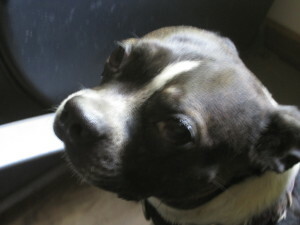 Some of you may remember Bingo from the blog post I made when he came back to live with me in 2008. http://bostonrescue.blogspot.com/search/label/Bingo . NEBTR did a Chip-in to help with his initial medical expenses which was such a great help to me at that point. 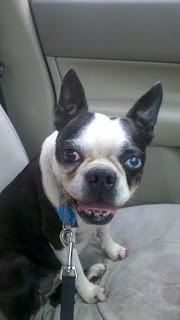 After Bingo's previous owner, his beloved Emma, had a stroke and he came to live out his life with me, we dealt with horrible dental issues, Mast Cell, Atypical Cushings, and a list of other health ailments. But Bing was always happy and easy going. He was a love who would wake me up in the middle of the night by just staring at me intently.... trying to tell me something. I would wake to his face about 6 inches from mine and his eyes focused on my face. He loved belly rubs and relaxing in the sun - belly up of course. He loved walks and car rides, and especially his stuffed bones . He was good with all the other critters, and especially loved my NEBtR foster, Benny when he was here. He was best buddies with my 16 year old ailing cat, Trinity. It was so cute to see them laying together - a chubby old BT man and a skinny old long haired calico cat. Bing recently had some difficulty with a Hemangioma in his nose along with inflammation and infection. Nasal endoscopy and a good teeth cleaning with Dr Ron Hodges in Allentown diagnosed and allowed us to treat Bing and keep in comfortable for a while. Last weekend Bing seemed to fade.... he was not comfortable and was beginning to have difficulty passing air through his nostrils. He told me yesterday morning that he was ready go to be with Emma again. I miss my little Chubber, but know I did the right thing for him. "I am so sorry to hear about Bingo. But please know that it was his story that first inspired me to contribute to NEBTR and then join the group. We had his photo on our refrigerator for years. Please be comforted to know that he is now at peace." Tucker who was fostered by Traci Grant went to his new home. He was adopted by the Archers from Philadelphia. 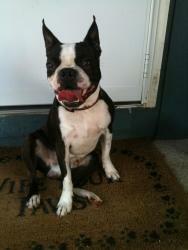 Tucker is a 2 year old who loves people, and who followed his foster mom everywhere. He has plenty of energy to go around, and loves lots of walks and exercise. Congratulations Traci and thanks for taking such great care of Tucker. It was hard for her and her family to say goodbye but I know every foster home will agree that it is never easy and each one takes a piece of your heart. Just as important, anyone who has a adopted is forever grateful that those foster homes gave you the opportunity to bring those pups into your lives. I just picked up my first foster this evening, Miss. Bailey here in Altoona, PA. She is a 7 year old female with a blue eye. I will obviously give more details as I find them out. Will keep everybody posted! She had a choker collar on when she was surrendered, but the first thing we did was to get her a turquoise buckle collar to match her pretty blue eye! 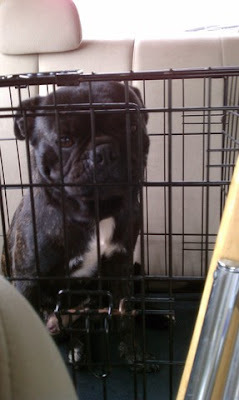 I just wanted to fill everyone in on my first foster Mack, a Boston/Pug mix. . I just picked him up on Sunday and already he fits right in. I am going to take him to the vet on Thursday and hopefully get him neutered soon after. I attached a pic of him on the way to our house( he is so cute). 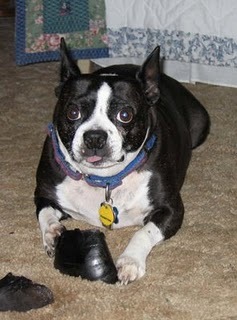 Congratulations to Zippy, who was just adopted by the Grohski/Ryan family fro Wilmington, DE. Congratulations to his wonderful foster mom Sandy Allen for a job well done! Zippy certainly lives up to his name and will zip around your entire yard. He has way more pick up and go than any 8 year old we have ever seen, especially if you have a ball. He will play for hours! He can look forward to many happy games of fetch! "I met a dog today... Not unusual becuase I own a dog boutique:) but today I met a VERY special dog... one that broke my heart... one that stole my heart... and everyone else's that walked in the store for the hour she was there.. Today ...I met Baby... I watched her say hello to a boxer 4x her size... kiss and protect a 16 month old child.. get bitten in the bum (playingly) by a 14 week old cane corso without even a yelp.. and fall asleep in my lap 30 minutes after meeting me.. Why is this so amazing? Because Baby is a shelter dog.. and is now in foster care for only 7 days when I met her. Baby was neglected and becuase of this nearly blind.. but she is one of the most amazing pups I have ever met and just needs someone to love her as much as she loves everyone else..."
We are thrilled to report that Popeye is doing great! All it took were gel drops after a month of other prescription drops and antiboitics. Popeye now has vision of 80% and has a super life. Popeye is a tribute to the wonderful power of love! 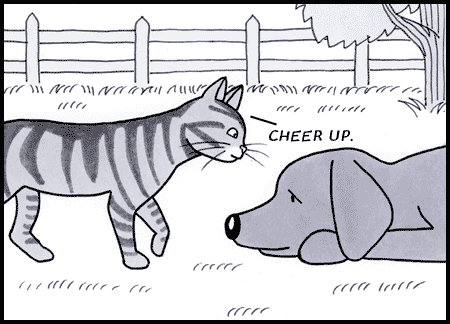 Tomo and Roger from Paws Greetings have a new daily webcomic - Dog In Charge. They want you to stop by for a visit. If you like it, please spread the word! Paws Greetings has donated items to NEBTR in the past for our fundraisers, so support our friends!